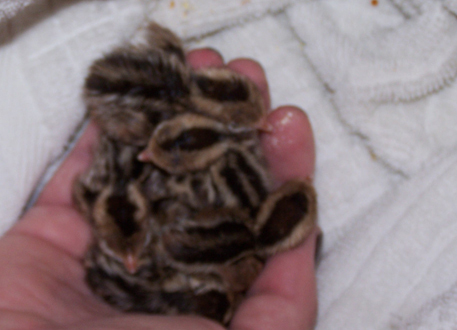 We rescued 5 abandoned baby quail on July 4th, 2009….the day they were born. 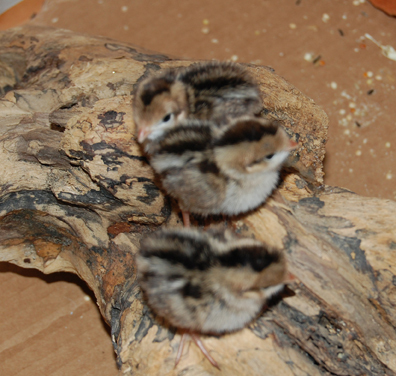 Quail aren’t that smart…at least the parents of these babies. They built a nest in a planter where the babies could not get out after they hatched. They do this every year. This year, they got 5 out and left 5 in the nest. Their call: ” Woooo Tooooo! Woooo Tooo!”. They quickly adapted to their penned life and started to thrive. Our dogs, Lulu and Baily claimed them as their own. 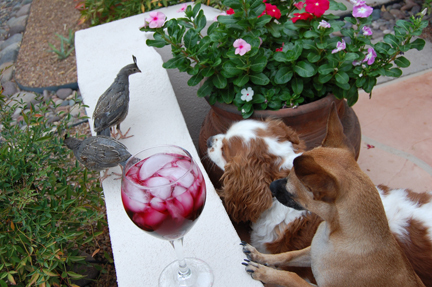 The only way the baby birds would settle down is if Lulu or Baily were in attendance. Unfortunately, 3 did not make it. Only 2 survived. We released them in September. 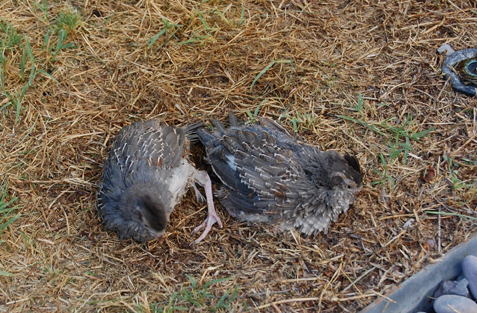 This was the first thing that they did…plunked down in the grass and lounged! They spent many happy hours on the porch with us. At the end of each day, when the sun started setting, the whootoos would make their way back to the fenced area where we released them. This is where they roost for the night. 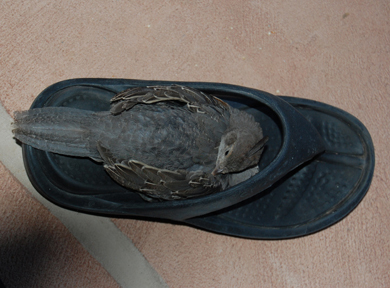 Although, sometimes they would take a little nap on the porch! 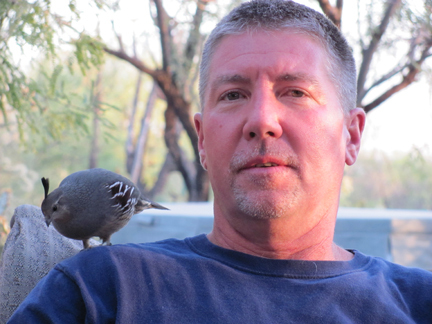 As the weather started to cool, the whootoos spent more and more time out with the wild quail in the yard. 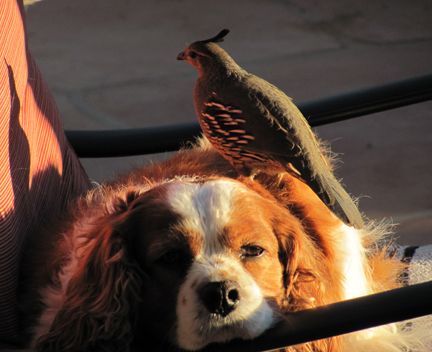 Eventually, one of them (we had dubbed Hook) joined a covey and she did not come back to the porch. 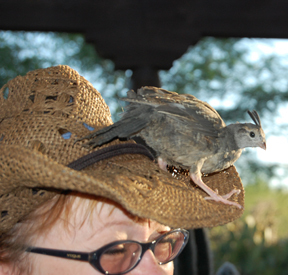 The other, we called Hootch, still came back to the porch now and then to do a little socializing. This was the day Hootch came to say farewell. She sat with us for about an hour, said her goodbyes, and left for the wild. We see Hook and Hootch everyday. They still roost where we released them. They both found groups and hopefully mates. We will anxiously wait to see if they have their own babies and possibly bring them by for a visit! We will also see if there is another batch of babies to rescue from the planter this summer!